Home > Memories of Alhambra > Memories of Alhambra Watch party!!! We loved the last watch party so much that we decided to do it again! This time for the science-fiction/fantasy drama Memories of Alhambra starring Park Shin-hye and Hyun Bin! 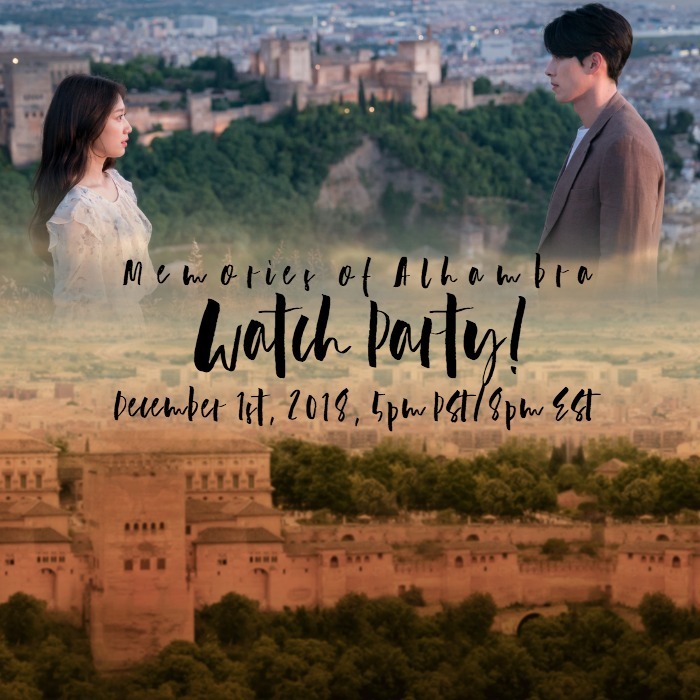 Join us December 1st at 5pm Pacific Standard Time (PST) and 7pm Central Standard Time (CST) as we chat/text/gush about the first episode of Memories of Alhambra on The KThree’s Youtube page. Below is a summation of a question and answer session that the writer gave about the drama. Question 2: Why did you pick Alhambra palace? Like Granada, where Muslim and Catholics whom are very different to each other, coexist, in the drama Alhambra palace is a symbolic place where two different worlds coexist. Jin-woo (Hyun Bin) wears a smart lens in Granada and sees another special world. Question 3: How was it to work with Director Ahn Gil-ho on augmented reality? There are no dramas based on A/R so while writing the script I worried about how it would look on screen. However, I trusted Director Ahn Gil ho 100%. I send my admiration to the director for perfectly realizing this world that no one has tried before. Question 4: What would you like to convey to the viewers? This drama is about two people, Yoo Jin-woo and Jung Hee-joo, whom belong to very different worlds. Starting from the first meeting the magic & science, analog & digital, middle century & modern, and Granada & Seoul, all those unmixable worlds, mix together. With this fantastic experience, I want to show love & human beings endless greed. With Memory of Alhambra, romantic classical guitar and cutting edge technology meet. What special things will happen? We plan on recapping this show live as it airs on our (as to be made) Patreon page! But we will post each episode 24-48 hours later over here on Drama Milk. Hope to see you at the watch party on December 1st! PS. Just a note about our Patreon page, we plan on creating a post just for it in the coming days, but the gist of it is that we are trying to phase out our pop up ads on this site. We hope to use Patreon as a way to do that so this will be an experiment of sorts. Patrons will get first dibs on our Saturday & Sunday live recaps starting with Alhambra. Alhambra is the guinea pig drama, so hopefully it will be a good one! Tx for the invite! looking forward. So happy to have you hanging out with us!